Outside of the initial buzz, I haven’t paid much attention to Rise of the Teenage Mutant Ninja Turtles on Nickelodeon. I have nothing against it, as it obviously breathes new life into the franchise and exposes the characters to a newer crop of young fans. But it’s just not my thing. But this piece by comic artist Billy Martin? Totally my thing. 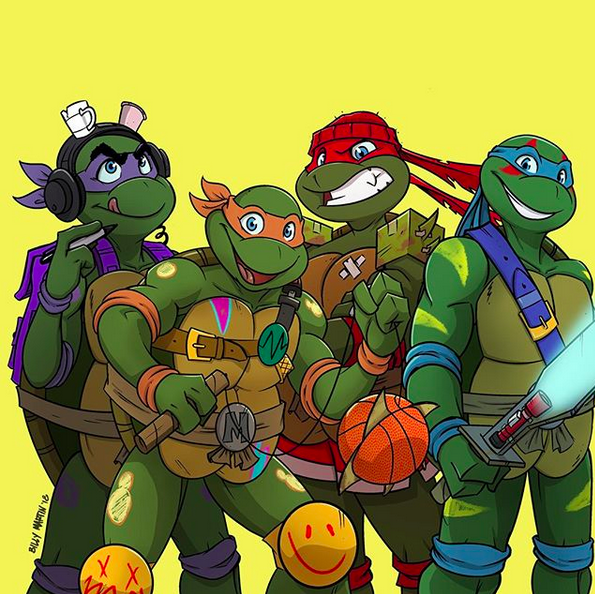 In the spirit of Halloween, Martin draws the Turtles from the ’80s cartoon show dressed as their counterparts from Rise of the Teenage Mutant Ninja Turtles. It’s a fun look at the contrast between the two designs, while at the same time keeping things playful. Martin is no stranger to the boys in green, having done plenty of work on the more kid-friendly books at IDW. His official site can be found here. This entry was posted in Uncategorized and tagged Astonishing Art, Billy Martin, Donatello (TMNT), Halloween, IDW Publishing, Leonardo (TMNT), Michelangelo (TMNT), Nickelodeon, Ninja Turtles, Raphael (TMNT), Rise of the Teenage Mutant Ninja Turtles, Rob Siebert, Teenage Mutant Ninja Turtles, TMNT on 10/31/2018 by primaryignition.